While the majority of people do not have to think twice about the season, many do. While some people can curl up into a blanket when it gets cold, some can’t. While some people can put on a jacket when they feel chilly others can’t. Some people wear a third layer, so they don’t get a cold, other people are struggling to find a first layer of clothing. Unfortunately, not everyone can easily prepare for the winter. One of the major problems that is gravely affecting the homeless community is the lack of adequate clothing, and in the winter time, it is very important to have access to the correct amount and type of clothing to protect yourself from the sometimes harsh conditions. In the winter, people are susceptible to acquiring many diseases ranging from the common cold to freezing to death. All of which can be prevented by wearing additional clothing. Therein lies the problem however, as many homeless people do not have the proper clothing! One of the most important articles of clothing needed to prevent ailments such as hypothermia are shoes. One of the major skin disease that homeless communities are susceptible to is Staphylococcus aureus, whose infection rate in an average homeless community is on the upwards of 77%. This disease can be greatly reduced by using shoes, as they cover up and protect the otherwise exposed skin. 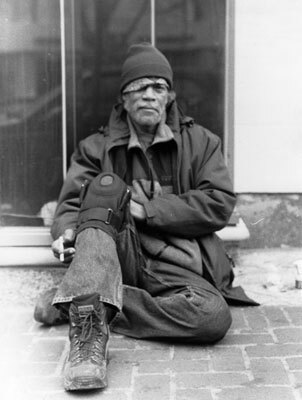 Sadly, this is no surprise as nearly 48% of the homeless population in the United States, which is roughly 500,000 people, do not have access to shoes in order to protect their feet from the weather conditions and diseases . Without the proper resources, the health of the homeless community will diminish rapidly. Along with shoes it is important to have other forms of clothing such as jackets, shirts, socks, and gloves. Without the proper amount of clothing things the cold weather could cause other risks to people’s health such as heart attacks. Because cold weather acts as a “vasoconstrictor, which means it narrows blood vessels”, it may lead to a higher risk of a heart attack. The best treatment for this would be to have more clothes on, but for these little to no income people, obtaining clothes is very difficult. Like a heart attack, other serious risks that people without the proper clothes might have to endure are frostbite and hypothermia. With warm clothes and multiple pairs of socks, both health risks are very hard to come by. For those that do not have these items however, it is more common. Frostbite may be able to spread across a limb in as little as 30 minutes , which may lead to the need for amputation or in the most extreme cases, death. Hypothermia on the other hand kills roughly 700 homeless people each year, making hypothermia the second leading cause of death for homeless people. However, the hardships don’t stop there. Along with the winter season, the hot and humid seasons are just as dangerous for homeless people. Because of their lack of many clothes, they are forced to wear the same clothes during the summer season, possibly leading to heat stroke. Homeless people will walk around even in a hot mid-summer day with their thick jacket on, because they have no other clothes to wear. When one over heats the body by wearing to many layers, they run the risk of possibly suffering from dehydration, heatstroke and even fainting. While the homeless community has trouble finding enough clothes to wear and stay healthy, the public has too many clothes, and doesn’t know what to do with all of it. America has an abundance of textile waste that crowds our landfills. Our landfills have over 21 billion pounds of textile and clothing waste accumulating each year while some homeless people have only one jacket and are freezing in the winter. There are several solutions to supply the homeless with the adequate clothing that is needed, but the best solution involves bridging the gap between supply and demand. Organizations such as Goodwill and Salvation Army are already doing this. Companies like these have created the idea to collect the old, and extra clothes from families or other people, and they bring this surplus of items to the under privileged and homeless communities. For the best results of decreasing our textile waste and providing clothes for those who need it, stores should directly donate and supply clothing to homeless shelters for their inhabitants to have. Companies large amounts of clothes that are not sold and instead of disposing of the clothes, they can be given to homeless shelters for people to wear. For example, this past year H&M had 4.3 billion dollars’ worth of clothes that did not get sold. Some companies have already started doing similar things such as Toms, which has a buy one and we donate one deal for all their transactions. Winter is coming whether we like it or not, and all of us need to prepare. While some of us have the clothes and protection we need others don’t. There is however a solution, companies and people to donate their old, unsold, or extra clothes to shelters and organizations that redistribute them to the homeless and under privileged communities that are unable to get clothes. By sharing our extra clothes with homeless communities, we will be able to help save the lives of homeless people, reduce our waste in our landfills, and make a difference in this world. Common cold. (2017, August 08). Ten facts about socks, feet and homelessness. (2015, June 02). Podiatric Health Needs of Homeless Populations as a Public Health Concern. (2012, May 08). Kicks 4 The City. (n.d.). Statistics. Harvard Health Publishing. (n.d.). How does cold weather affect your health? Stöppler, M. C. (n.d.). What is Heat Stroke? Sign, Symptoms, Treatment & Prevention. Council for Textile Recycling. (n.d.). Paton, E. (2018, March 27). H&M, a Fashion Giant, Has a Problem: $4.3 Billion in Unsold Clothes. T. (n.d.). The One for One® Company.